It has been a very busy few months! I've got a couple of days off now, first time I've had two in a row off in a while. I've been stitching up a storm of late on a few things. I finished a present for Vikki Clayton - I designed a sign for her shop, to put up near the counter. :) It's done on her linen, in her threads (of course). I worked on Rachel's piece for a little while, but I can't work on that for long stretches - all the fractional stitches give me a headache - quarter stitches on 45 ct (which after dying and washing is more like 48 ct) is NOT fun. So I only work on it a little at a time. Currently I'm working on a Chatelaine piece, Alhambra Garden. I don't quite understand why everyone says these take so long - I'm flying through it. Sure, by the time I'm done it will have been about a year since I started, but in total I've only worked on it for about 2 weeks and I've got it about 1/3 done. It's mostly DMC, which as most of you probably know, I don't use. I'm using Hand Dyed Fibers for it and I love how it's turning out! Vikki's DMC matches are pretty good - not exact, usually a bit lighter/brighter overall, but much better than most DMC conversions you find out there. 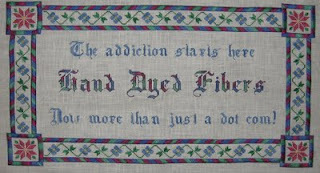 I've been playing with colours for Rosewood Manor's Quaker Diamonds as well. Again, because I don't use cotton, I won't be using the called for Valdani colours. Plus, I don't often use 28 ct unless I'm stitching over 1, so the heavy Valdani threads would be useless to me anyway. I know they do regular floss, but it's dyed on DMC. I've been thinking it might be a good time to try Carrie's silks out and just pick my own colours for this. Heck, I haven't even ordered the chart yet! I will be eventually, but money is a bit tight for at least another year around here, so I'll wait for the next sale at Wasatch to pick up a bunch of things all at once! There are a couple of new Ink Circles that I'm drooling over as well. I am going to kit up Chatelaine's Rose Garden Mandala this week - I did a conversion from the DMC, this time to Eterna Silks. I haven't used them in a while but I really do like them, so I thought I'd have a play with them for this piece. I was sooooo happy when Cindy put up a kit at ECS. I couldn't stomach buying the one from TGOS, especially since it's $30 more just for a few skeins of DMC. Cindy also gives the no fabric option, so it works out perfectly since I have yards and yards of fabric here. And of course I'm working away on the computer trying to come up with a few new designs. I just haven't been feeling very inspired lately. Maybe it's this nasty cold I've been suffering with for weeks, or just plain being tired. I'm doing pretty good though, I managed to make it through 8 shifts in 9 days - probably why today I feel like I'm dying. I think I need a vacation from work to get the creative juices flowing. I sit here looking at my sketches of what I want, but when I try to translate them to computer it just doesn't jibe. Jon keeps telling me not to get frustrated - designing is supposed to be fun for me. He gets angry when I start getting all business-like and treating it like a job. He made me swear that I would only design as long as I was having fun with it and that he didn't want designing to destroy my love of the hobby. So I'm being patient. I know the creative bug will bite again, and I'll whip out several new designs in a heartbeat. It's frustrating when you can see the design in your head but it just won't come together on the screen!